Not since "Avatar" has a box-office hit had the kind of staying power of "Black Panther." 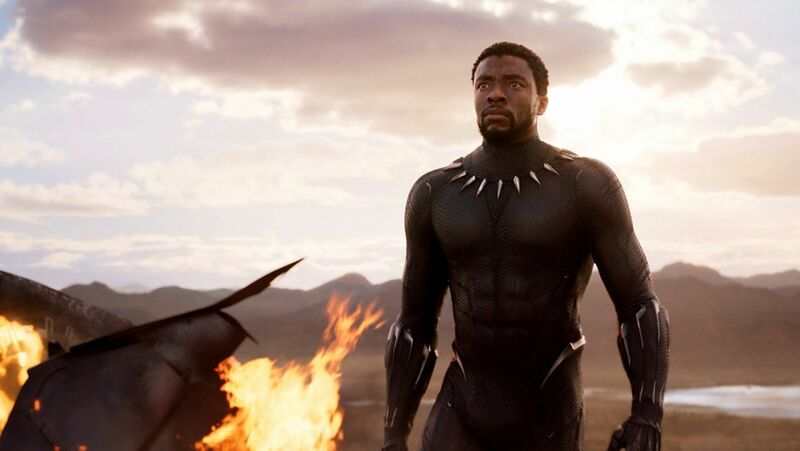 Ryan Coogler's comic-book sensation on Sunday became the first film since James Cameron's 2009 smash to top the weekend box office five straight weekends. The Disney release grossed $27 million in ticket sales over the weekend, according to studio estimates, pushing its domestic haul to $605.4 million. Worldwide, "Black Panther" has grossed more than $1.1 billion. Though "Black Panther" has had little competition to contend with throughout February and March, such consistency is especially rare in today's movie-going world. Before "Avatar," the last film to do it was 1999's "The Sixth Sense." 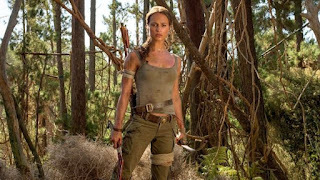 rebooted "Tomb Raider," starring Alicia Vikander as the archaeologist adventurer Lara Croft. The $90 million film opened with $23.5 million, largely failing to stir much excitement among moviegoers. Critics gave it mediocre reviews (49 percent fresh on Rotten Tomatoes) and ticket-buyers responded with a "meh," giving it a B CinemaScore. With Vikander stepping in for Angelina Jolie, Roar Uthaug's "Tomb Raider" is an attempt to rekindle a video game-adapted franchise that faded quickly the first time around. The 2001 original opened $47.7 million and grossed $274.7 million worldwide, but the big-budget 2003 sequel flopped, opening with $21.8 million domestically and grossing $156.5 million worldwide. Jeff Goldstein, distribution chief for Warner Bros., said "Tomb Raider" came close to studio expectations in North America but that international ticket sales were a primary focus. "Tomb Raider" was no. 1 overseas, grossing $84.5 million, including a $41.1 million in China. "International was always a key part of the strategy," Goldstein said. Of course, the continuing success of "Black Panther" also didn't help "Tomb Raider." When release dates were being set a year ago, few could have foreseen "Black Panther" no. 1 five weeks in. "How could you?" Goldstein said. This image released by Warner Bros. Pictures shows Alicia Vikander in a scene from "Tomb Raider." 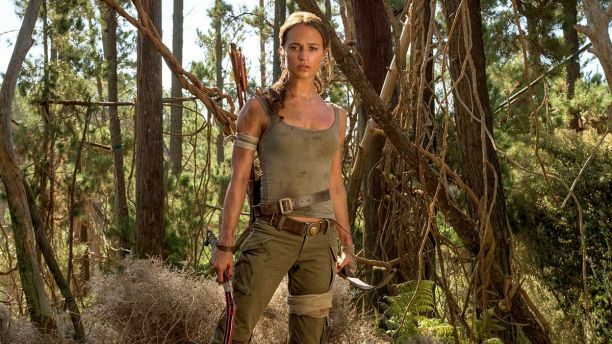 It took weeks of training and plates full of protein to turn former ballerina Alicia Vikander into action star Lara Croft. "Black Panther" has shown considerably fewer legs in China, however. Though it has grossed $96 million in two weeks of release in China, "Black Panther" slid steeply in its second weekend. Yet last week, "Black Panther" even bested Disney's own "A Wrinkle in Time," Ava DuVernay's adaptation of Madeleine L'Engle's 1962 novel of the same name. In its second week, "A Wrinkle in Time" dropped 50 percent with $16.6 million in ticket sales. The surprise of the weekend was the Lionsgate-Roadside Attractions Christian drama "I Can Only Imagine," which grossed $17.1 million on 1,629 screens — less than half the number that "Black Panther," ''Tomb Raider" and "A Winkle in Time" played on. The film, which co-stars Dennis Quaid and Cloris Leachman, cost only $7 million to make. It stars J. Michael Finley as the singer behind one of the most popular Christian songs, by the band MercyMe. "I Can Only Imagine" doubled expectations by sticking to the typical tactic of "faith-based" releases with a grassroots marketing effort that focused on Southern, Southwestern and suburban moviegoers. Eighty percent of the audience was over 35. It's the biggest opening weekend ever for Roadside Attractions, the 15-year-old indie distributor whose previous titles include "Mud" and "Manchester by the Sea." "We did really work the film. Starting with the beginning of October, we were screening the film for faith-based influencers," said Roadside co-founder Howard Cohen. "So it had a really classic playbook for these type of movies. But a lot of movies do it and it doesn't work as well." Playing to a virtually opposite audience was 20th Century Fox's "Love, Simon," the first film from a major Hollywood studio featuring a gay teen protagonist. Whereas "I Can Only Imagine" catered to the suburbs, "Love, Simon" thrived mainly in urban areas. Greg Berlanti's film, adapted from the best-selling young-adult novel "Simon vs. the Homo Sapiens Agenda," stars Nick Robinson as a gay 17-year-old who has yet to come out when another closeted boy from his high school begins an anonymous e-mail romance. The film garnered strong reviews (91 percent fresh on Rotten Tomatoes) and audiences agreed, giving it an A-plus CinemaScore. "I feel good that we released this film. I feel great that we had the kind of exit polls that we did," said Chris Aronson, distribution chief for Fox. "I think audiences are going to continue to find this jewel of a film that Greg Berlanti created." According to comScore, the weekend was down 50 percent from the same weekend in 2017 when Disney's "Beauty and the Beast" opened with a record-breaking $174.8 million. Where available, the latest international numbers also are included. Final three-day domestic figures will be released Monday. 1. "Black Panther," $27 million ($30 million international). 2. "Tomb Raider," $23.5 million ($84.5 million international). 3. "I Can Only Imagine," $17.1 million. 4. "A Wrinkle in Time," $16.6 million. 5. "Love, Simon," $11.5 million. 6. "Game Night," $5.6 million. 7. "Peter Rabbit," $5.2 million. 8. "Strangers: Prey at Night," $4.8 million. 9. "Red Sparrow," $4.5 million. 10. "Death Wish," $3.4 million.